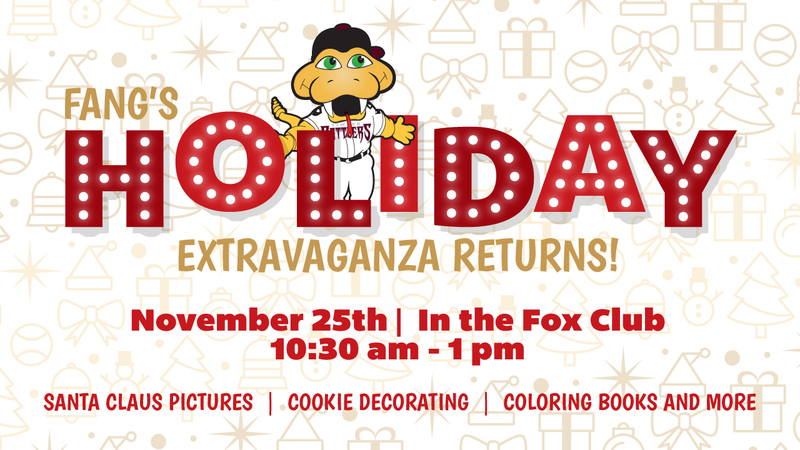 GRAND CHUTE, WI - Wisconsin Timber Rattlers mascot Fang T. Rattler is hosting his sixth annual Holiday Extravaganza on Sunday, November 25 from 10:30am until 1:00pm at Neuroscience Group Field at Fox Cities Stadium. The event is free and open to the public. You are invited to come out to the ballpark to get into a holiday frame of mind. Mascots Fang and Whiffer will have cookie decorating and coloring for the children in the Fox Communities Credit Union Fox Club during the event. There will also be hot chocolate to keep the kids warm while they wait to meet Santa Claus! There will be a Hat & Mitten Drive during the Extravaganza. Fans are asked to donate new winter hats and mittens and the Rattlers will take the donations to area charities in need of these items. Anyone who purchases a 2019 Kids' Crew membership during Fang's Holiday Extravaganza on November 25 will receive a discount of 20% on anything else purchased in the store on that day - excluding clearance items, Fond du Lac Dock Spiders merchandise, and game-used items.